and contrasts, while the optimal molecular bonding of the RMC Oil Plus 2C with the wood remains guaranteed. ATTENTION: This product is a pre-treatment and does not protect the wood. 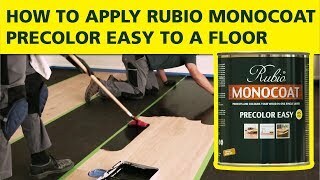 It has to be combined with one of our Rubio Monocoat finishing products for maximum protection. Available in 14 different colours, which can be mixed. Packaging: 100 ml bottle, 1 L, 2.5 L and 5 L cans.